The splendid design of this traditional wood console is finished in warm dark cherry stain. Ideal for a dining room, dressing room or bath, this cherry finish wood console is full of style and storage space. Beautiful cut-out scrolls adorn the open style doors inlaid with a grain pattern. Carved details surround the perimeter of the top and bottom. 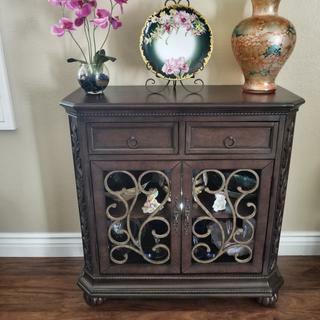 Large carved wood feet keep this unit secure and two drawers add extra storage space. 35" high x 34" wide across the top x 35" wide across the bottom x 14 1/2" deep. Weighs 72.5 lbs. Inside shelf is set at 10" high, but can be adjusted 2" up or down. Can hold up to 200 lbs. From the Kensington Hill brand of home furniture. Two doors and two drawers. Dark cherry finish. Solid poplar and MDF construction. Antiqued metal hardware. Minimal assembly required (legs and inner shelf). It is exactly what we needed to accent our Tuscan picture. The console looks like a higher quality cabinet. Are there glass panes in the door? As there are in the little side table? BEST ANSWER: There is no glass in the door. This console is absolutely beautiful and extremely well made! BEST ANSWER: The inside depth is 12" and the other corresponding piece in the collection is an accent table Style #Y6668. BEST ANSWER: Had to screw in the 4 base pieces. Place shelf inside with fittings for positioning. That is all I remember having to do. Beautiful piece! The only thing we had to do was to put the feet on. Everthing else was fully assembled. BEST ANSWER: This item is 35" high, 35" wide at the top, 34" wide at the bottom, and 14 1/2" deep. I store video, records and TV components in it. Was looking for the right look, the right width and the right height, and this Arianna Dark Cherry Wood Console fit the bill. And when they say warm cherry it is not. This cabinet is a very dark brownish cherry. If you do not mind that color scheme, this is a gorgeous cabinet. And on sale, even better. Is the wood absolutely perfect on this cabinet, no it is not, and to write a good review, must be truthful. 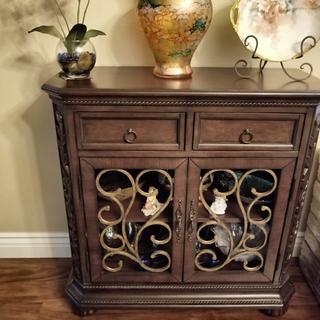 All in all this is a gorgeous cabinet, that can be used for most anything and this style fits in with my Tuscan style, I love this cabinet. The two pictures show it with two different Limoges Plates, was wanting the right plate for the top of the cabinet. My only negative would be that the two doors are not completely flush with each other, the wood is a bit rough on the very bottom, but all in all, a very nice cabinet and good looking for the money. Money well spent. does not match store or online photos! We plan to use it to hold a large screen TV and photos online and instore sample cloors were OK. The actual piece we got is VERY DARK and does not match our furniture. We had this item shipped to Maui aftr seeing it in the store. We made a hugh mistake and paying the price becuse almost impossibe to return !!!!! I use this in my living room and sometimes in the dining room, I use faux books in it and small photos, drawers are handy for things to hide away.. I had been looking for a console to put by our pool table; however, I was having difficulty finding something in the right dimensions. I needed to have it be narrow both in wideth and depth but yet serve the practical purpose of storing pool table items. This product was perfect and the price was right. It looks classy and fits in with our higher end furniture. We use this item in our living room/entry way. It looks stunning! The color is a little darker than the picture, but thats oky. My husband was happy that all he needed to do was attach the legs. Very easy! It was fairly easy for me to bring it home in the back of my SUV and get it into the house by myself. The feet just needed to be screwed on. No tools. Simple! Beautiful. Packed well. Fully assembled. We love it and it was just right for the hallway area we bought it for. Pretty and nice but STINKY! We are using it for a place to drop keys, sunglasses, change etc. when you come in from the garage. Great size but wish it had glass inserts! Accent piece. It was a perfect fit. I bought this beautiful piece of furniture. It looks great in my living room. I'm not sure if I would buy again.